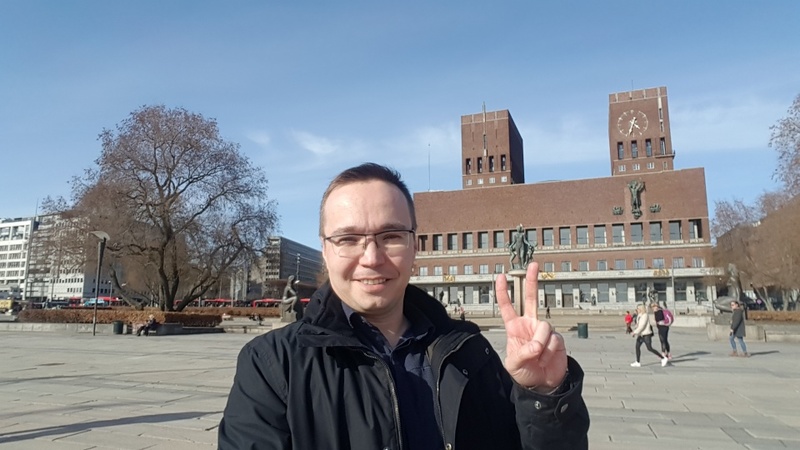 From 8th till 15th of April, Sergei Ponomarev participated in the seminar about climate change and resource management in Oslo, Norway. 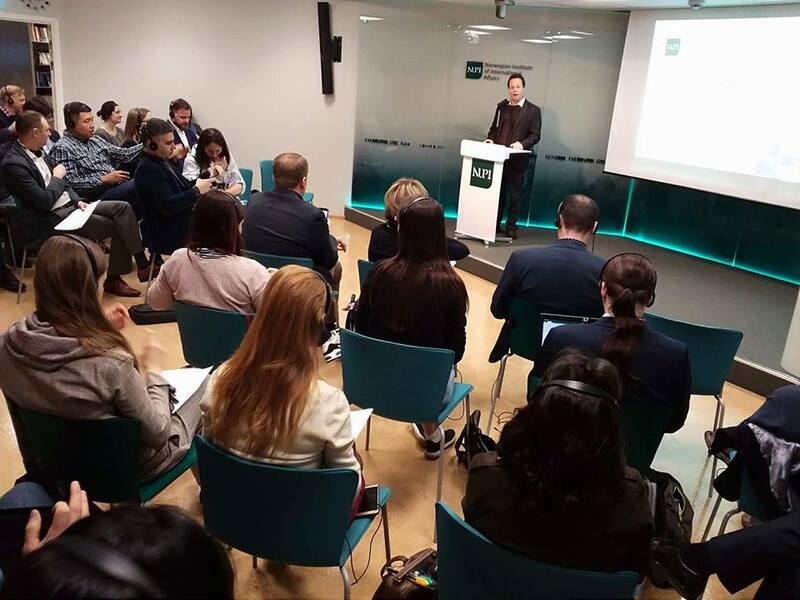 The main topic of the seminar was how Norway managed to overcome the "oil curse" (having found oil in 1969, the power elite also wanted to monopolize oil super profits, but the long struggle of public institutions did not allow it). As a result, the Norwegian State Pension Fund (Future Generation Fund) was created, which now has about 1 trillion dollars (! ), Considering that the entire population of Norway is 5.2 million people, they do not actually need to work at all. It is not surprising that Norway has already headed the list of countries on the human development index for many years in a row (the average salary in the country is about $ 5'000 per month). Money from the Fund is invested only in "the right companies" that do not violate human rights, are not caught in corruption, and are not related to weapons and tobacco. This is followed closely by the Ethics Committee, whose representative spoke about his activities. Much attention is paid to the transparency of companies. So it's very similar to what impact investors do. We had wonderful discussions and lectures about sustainable development and future challenges. Global warming from the abstract theory became new economic reality. Green, renewable technologies turned into base of the new world (and new markets). For the last hundred years, temperature has grown by 1 degree, it is followed by thawing of ice, increased acidity of ocean and it's level raising. This is not about any catastrophic scenarios yet, but weather will seriously influence our way of life, the century of thoughtless unlimited consumption is replaced by an era of ecological restrictions. We will have to adapt to new conditions. 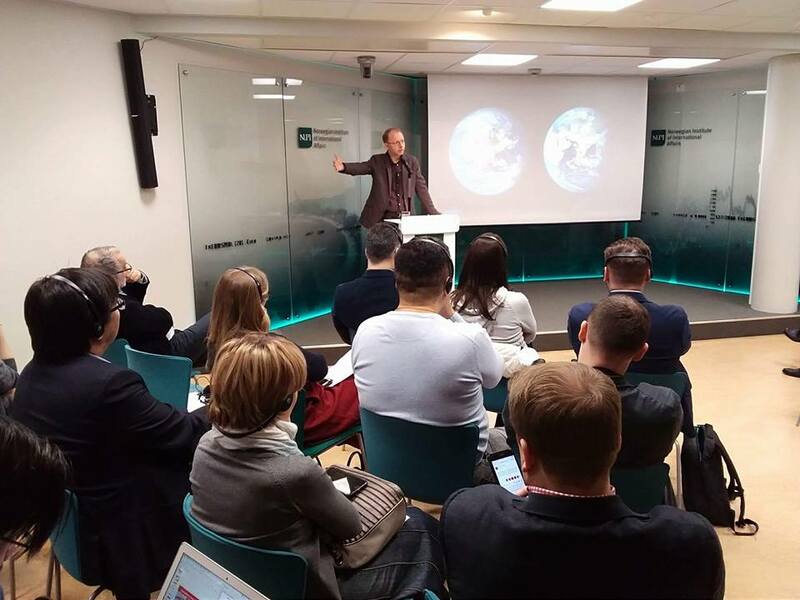 Many thanks to The Norwegian Institute of International Affairs (NUPI) which makes a wide range of research activities and disseminates information on international issues. And also for our remarkable partner The Moscow School of Civic Education. 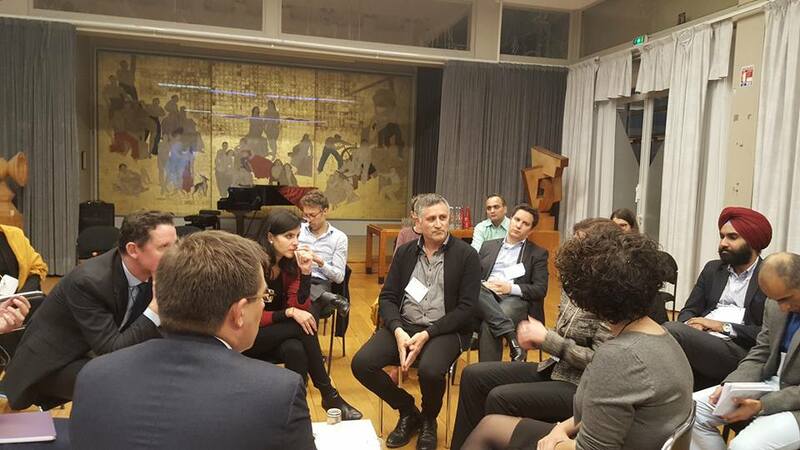 Svetlana Baurens participated in the conference Impact Park about Impact Investing in Milano. Impact Park, organized in collaboration with Rancilio Cube, is the First Italian event dedicated to international impact investing. During the 3 day event impact investing was discussed through pitches, keynote speakers, reverse pitches (when the companies pitched to attract social projects and round tables). Speakers from all over the world and personalities of Impact Investing joined the event to share their point of view about impact investments. The challenging goal was set up from the beginning to move towards "impact economy" with the help of technological breakthroughs, such as blockchain and artificial intelligence. The experts of the conference clearly noticed the evolution of investors preferences from traditional to impact investments with proactive search for social and environmental impact with a broader range of return. With the words "We are the power behind the decisions, we are the power to make our economy - impact economy", by Julia Balandina Jaquier, this high level of impact was set and maintained through the whole conference. The true Social entrepreneurs must endeavor to create such projects, which would change systems for the better in social and environmental aspects, and lead to "deep impact". If we compare it to ESG (Environmental, Social, Governance) approach (or sustainable investments), ESG represents "broad impact", creating some positive change, but since they are liquid investments the ydo not challenge the system or the status quo of our way of living. Therefore, Impact Investing has a high potential to change the whole financial system, but tough choices and different solutions must made. As a bright example, the company VEGEA presented how they are using agro-industry byproducts as the source of new eco-sustainable materials. They created cost efficient alternative to animal and oil derived materials. The result is a material that is compatible with all the applications of fashion, furniture, automotive & transportation (yet without the impacts associated with conventional oil extraction). 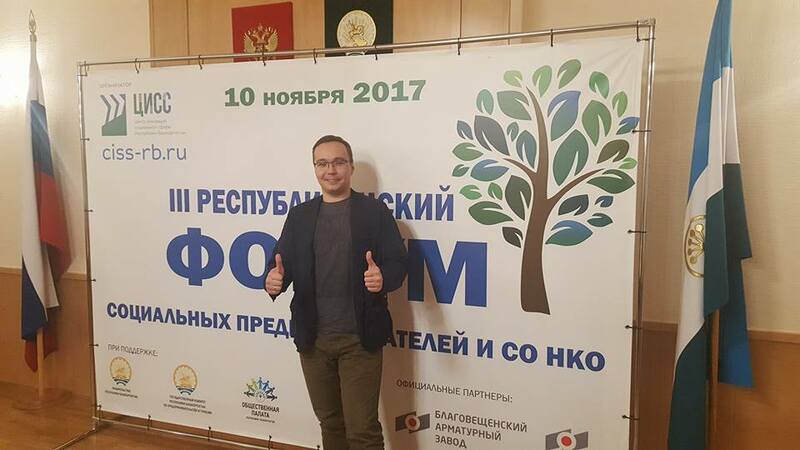 In November 2017 Sergei Ponomarev participated in a seminar of Moscow School of Civic Education in Berlin. 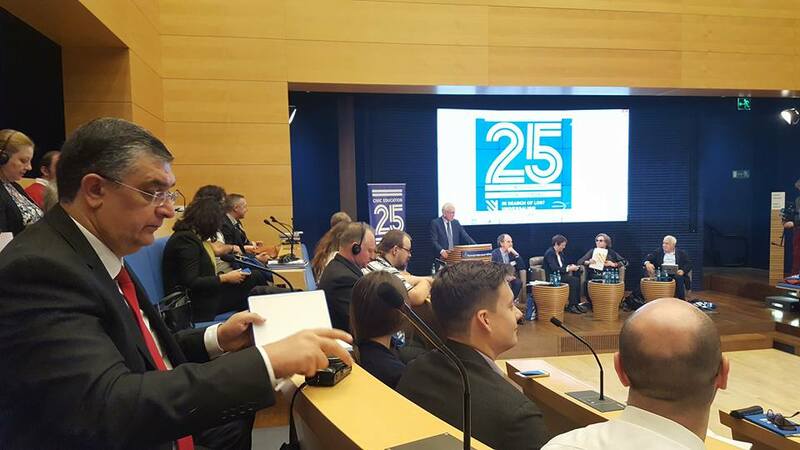 The seminar was dedicated to the calls of democracy and liberalism in Europe. The conversation about universalism began with a discussion on the existing challenges. We are living in a world of intolerance and post-truth. Universal values - conscience, freedom, human dignity, trust - are increasing in danger around the world. Freedom demands personal discipline and social literacy. Crisis of forms and places of decision-making, instead of rationalism - toxic forms of collectivism are emerging. 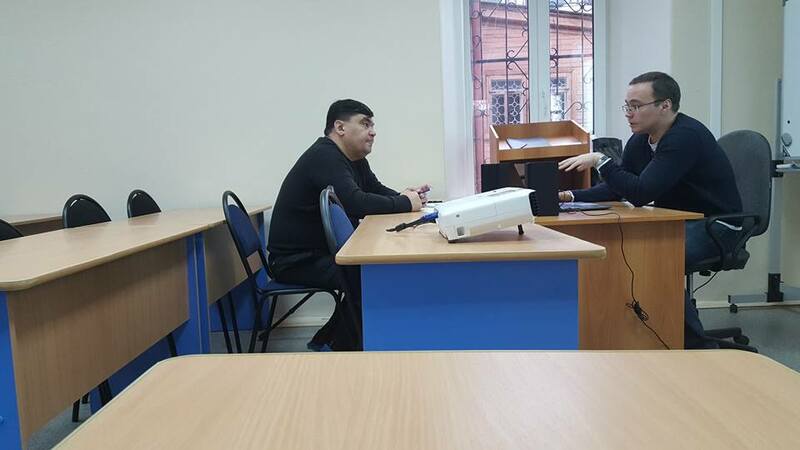 This new unmilitarized form of fascism raises its head in Russia. Huge geopolitical shifts, with the new role of China are ominous but there is always hope for a better world. New universalism has to be based on science, technology, ecological balance and international law. 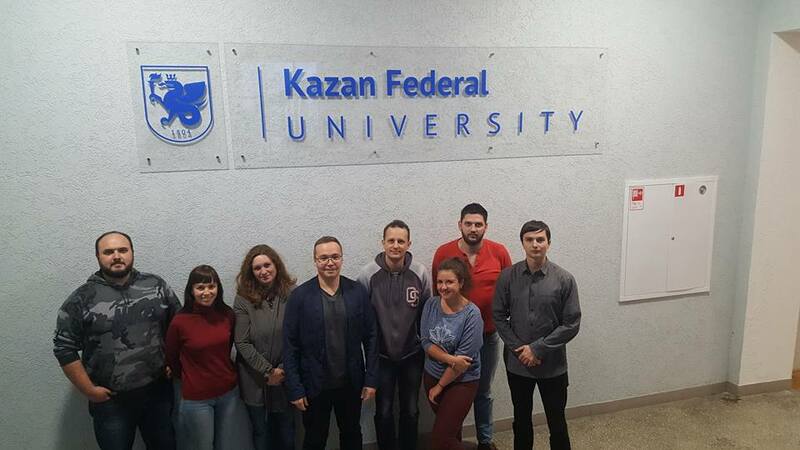 In Kazan, Tatarstan Republic, Sergei Ponomarev held the seminar for students of School of Social Entrepreneurship. The first day of the seminar was devoted to the current changes of the legislation in the social sphere. There were interesting debates about NGOs as producers of social services. 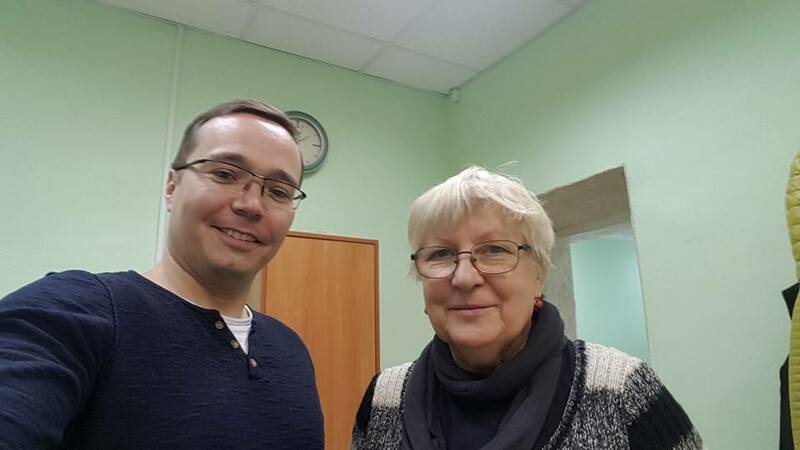 The next day participants got acquainted with the Russian and international experiences of providing social services and the operating measures of the government support. During the master class the audience learned how to find business ideas and estimate their potential. This included describing the target customers/users, described practical business models, potential financing sources, and so on. Finally there was a lively debate regarding various social ideas. 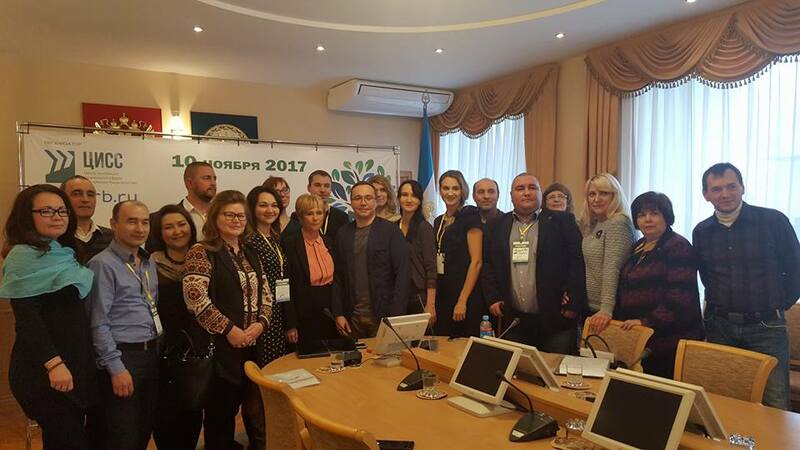 In November in Ufa, the Republic of Bashkortostan, the third republican forum of social entrepreneurs took place for social businessmens, heads of NGOs, government representatives, business leaders, journalists and the general public. More than 500 people took part in the forum. Successful practices in the sphere of social business became the main subject of a meeting. The forum was opened with exhibition of winners of the republican competition "The Best Social Project". Among them were heads of the rehabilitation centers, nursing homes, workshops for disabled people, and the children's developing centers. 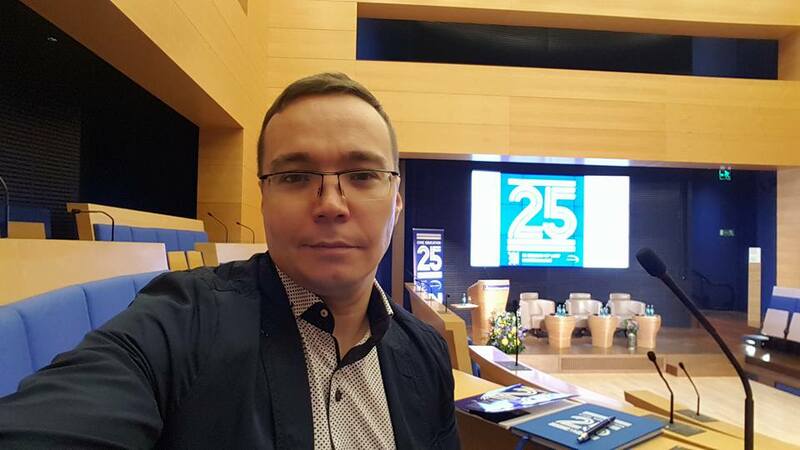 Sergei Ponomarev gave a master class "Financing of projects of social entrepreneurs". The forum ended with a fair of consultations with representatives of the ministries and departments of the region, including Tax administration, Ministry of Emergency Situations, Ministry of Labour, health care, education, etc. 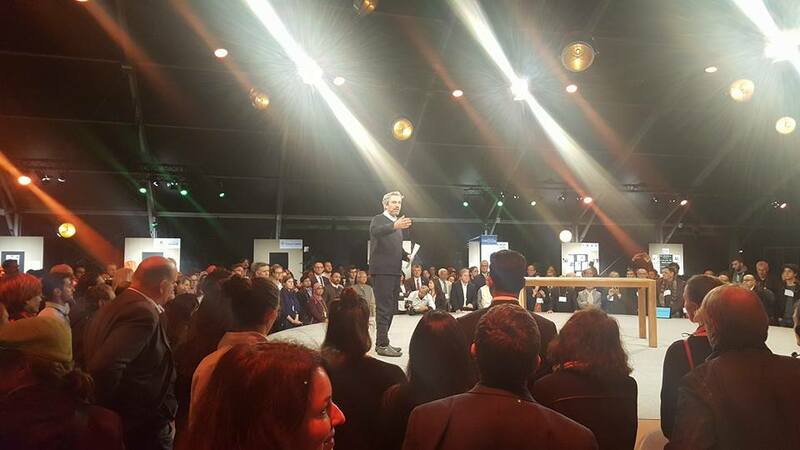 The 8th Global Social Business Summit took place in Paris from November 4th – 9th. It was an important step for the world social business community over the past years. A lot of new participants were invited with different backgrounds to increase impact and expand the social movement. The three main topic of the Summit were: inclusiveness, impact measurement and sustainability. The GSBS is the worldwide leading forum for social business, non-profit, non-dividend companies with a social goal. It serves to spread awareness about social business, foster discussion and collaboration between practitioners and stakeholders, as well as to present, conceive and develop best practices. 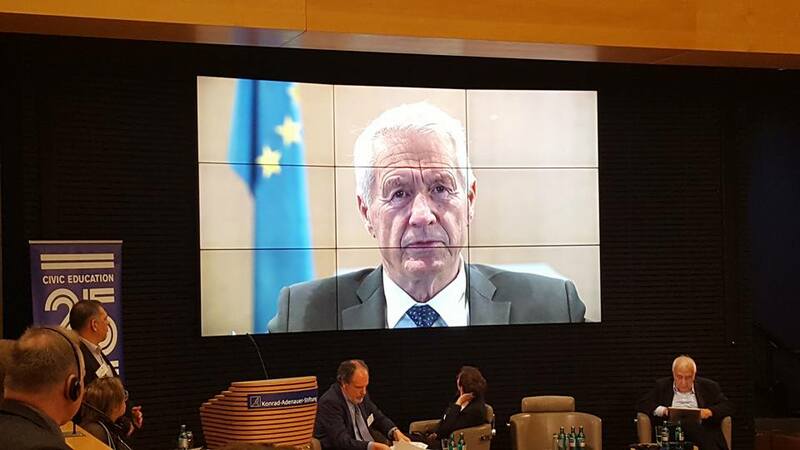 The annual event was organized by Nobel Peace Prize Laureate Professor Muhammad Yunus and his Creative Advisor Hans Reitz. They gathered experts from the private sector, civil society, governments and academia. Mr. Yunus spoke about the problems of violence, hunger and environmental pollution. He is sure that all these global problems can be solved, eradicated at their root, not far in the future, but now. He is sure that the combination of enterprise approach, new technologies and dedicated people are capable coping with the global challenges of mankind. 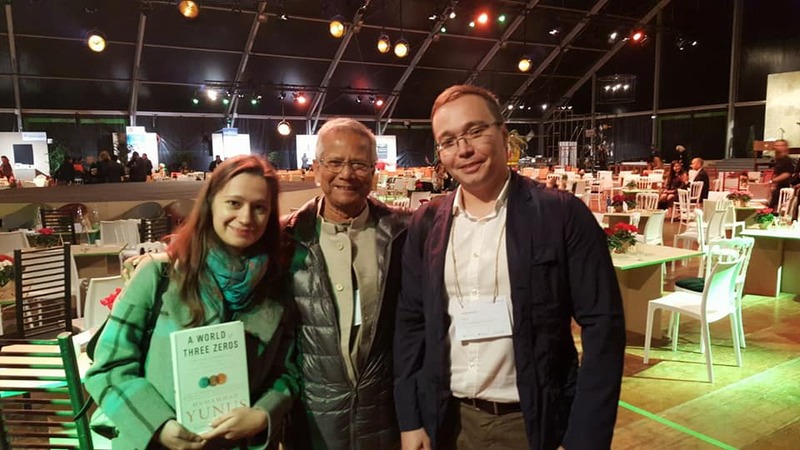 Sergei Ponomarev took part in this event and felt very lucky to talk with Muhammad Yunus and receive a copy of his book. 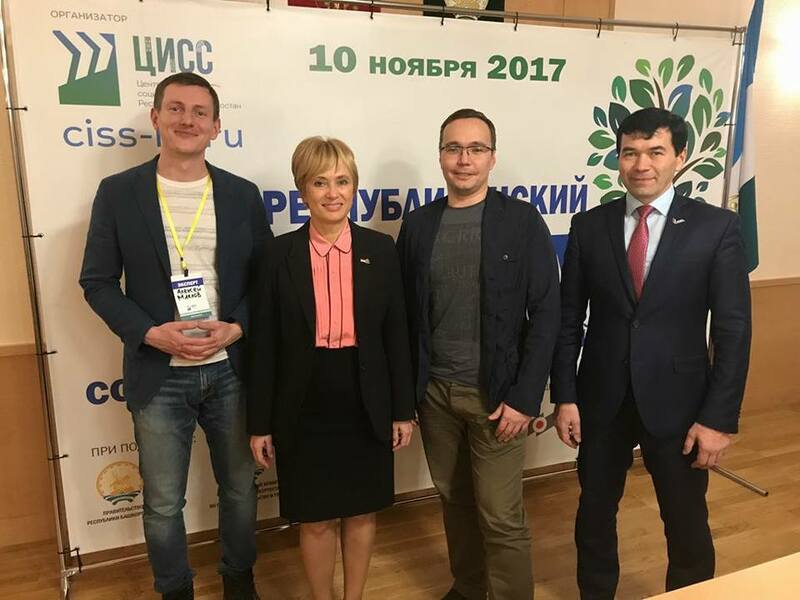 Svetlana Baurens and Sergei Ponomarev took part in International Conference "Social Innovations: Determining the Future" in Moscow. 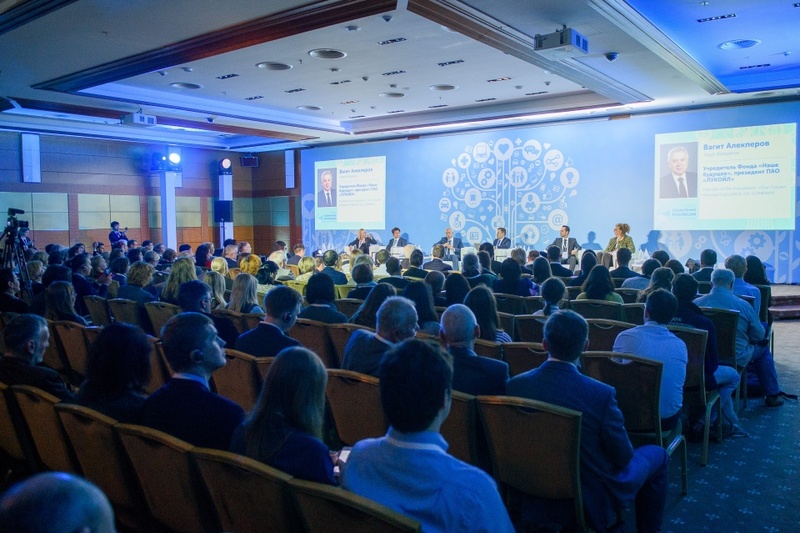 This is the first conference in Russia, where about 300 experts in the field of social entrepreneurship and social innovations from seven countries gathered on one site. Throughout the day, participants and experts at the Conference site exchanged experiences of the latest solutions in the field of social entrepreneurship in their countries. Leading experts from the United States, Great Britain, Italy, China, South Korea and Germany shared their experience. They talked about educational projects, socially transforming investments, state support of social entrepreneurship in their countries. The exhibition of the Conference presented various products of social entrepreneurs from Russia and abroad. Participants could buy natural cosmetics, listen to poemes performed by the anthropomorphic robot "Pushkin", learn how the Korean watch works for the blind people, try the delicious pasta from Kolomna and learn about the sets for studying the solar system from Bulgaria. 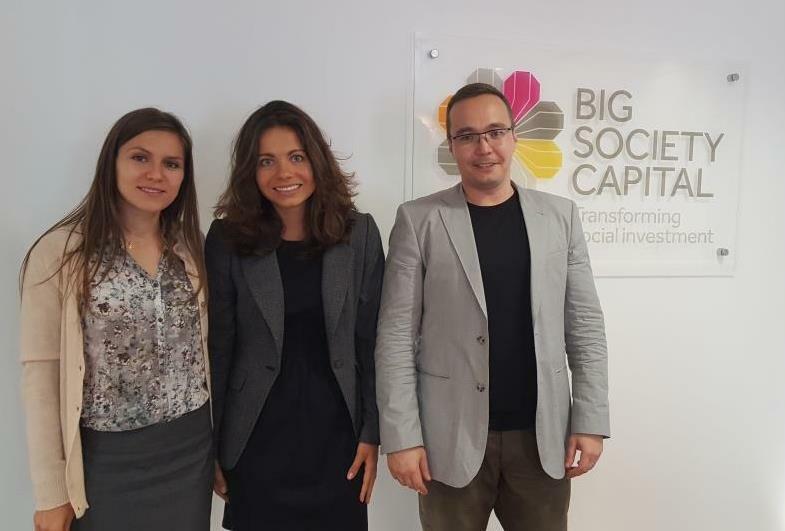 In July 2017 Svetlana Baurens and Sergei Ponomarev met with representatives of Big Society Capital in London. The aim of Big Society Capital is to improve lives of citizens of UK by connecting investments to charities and social enterprises that are creating social change. They do this by bringing together investment capital (up to £600m), expertise, and a network of partners. Big Society Capital wants to simplify the access of the social enterprises to financing. The do it through the promotion of innovative approaches to solving social problems and through the formation of a mainstream market of socialy focused investments. Over the last five years more than 400 projects have been supported, affecting hundreds of thousands of people across Great Britain. The volume of impact investments in Great Britain in 2016 was estimated at 2 billion pounds. Every year the companies and funds increase the volume of such investments by approximately 15–17%. Among impact investors there are a lot of "family offices", pension funds, insurance companies and banks. Additionaly, countries such as Norway or Saudi Arabia have also begun to put the public reserve foundations into the social sphere. We were talking about new trend of impact investments and perspectives of future cooperation.